Process Connection is a 1½"-16 AMP Tri-Grip (Tri-Clamp® Compatible) Standard Conforming to ASME BPE-2007. Other Cap Sizes and Styles are Available. Sensor Cables Supplied with Stripped Leads, Optional Connectors, Transmitters and Electronic Instruments are Available. Ungrounded Type J, K, T or E Thermocouples. The OMEGA™ TCS-S-CB and TCS-H-CB Series Thermocouple Sensors are designed for use in Sanitary or Hygienic Clean-in-Place applications in the Food, Dairy, Beverage and BioPharmaceutical industries. These sensors are manufactured with 316L stainless steel housings that meet the dimensional requirements of the ASME BPE-2007 Standard, and are welded and processed to provide a clean, smooth, 32 µinch or better surface finish in the wetted areas for easy cleaning. 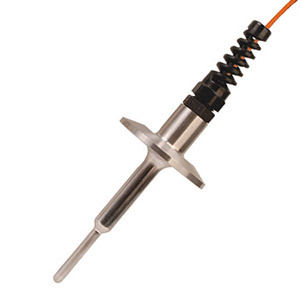 The integral cable with molded strain relief allows for easy and direct connection to your instrumentation. These sensors are also available in RTD and Thermistor styles to accommodate any process input requirement. In addition to the standard 1½-16AMP flange design, these can be provided in a wide variety of flange sizes and styles. If you need something a little (or a lot) different, we can accommodate your needs. For Type "E" or Type "K" Thermocouples, change "T or J" in Model Number with "E or K" at the same price. For cables longer than 120", change "120" in model number to the required length in inches and add $1 per foot to the price.